Jess and I went to see Doctor Strange on Friday, and I absolutely loved it. Sitting in the theater while the credits were rolling, I felt like I had to write about it. Since it just came out this weekend (in the States, at least), I don't want to spoil the movie for anyone. So I'll keep things spoiler free in my main review, and put anything spoiler-ific at the end (with a warning). One of the really cool visual tricks of the movie was the kaleidoscope-like effect it used when certain characters were able to bend the physical world. 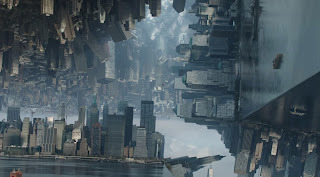 When these shots were first shown in the trailer, many people complained that the movie was just ripping off Inception. Apparently, many of these shots were actually shot-for-shot recreations of Doctor Strange comic book panels, which predated Inception. But I also think the effect was used very differently in Doctor Strange than it was in Inception, so it didn't feel derivative to me at all. There was also a very visually striking sequence in the film where Stephen Strange (played brilliantly by Benedict Cumberbatch) was shown by The Ancient One (Tilda Swinton) the many different dimensions that exist outside of our material world. Parts of that sequence were reminiscent of "trippy" sequences in other films, but the way everything was strung together was unique. As a viewer, I was bombarded with visual after visual, going from awesome to beautiful to weird to disturbing, until I was overwhelmed. Which I believe was exactly what the director, Scott Derrickson, was going for, since Stephen finished the experience feeling similarly overwhelmed. Well, probably more so. This movie is one of the few movies that Jess and I have paid extra to see in 3D. I'm not necessarily sold on the idea of movies needing to be made in 3D. 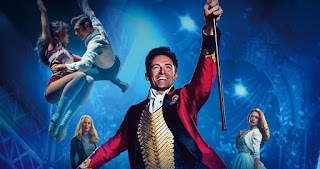 And we're not going to go out and buy a 3D TV, but the beautiful and - pardon the pun - strange visuals of this movie merit at least one 3D viewing. To me, it was worth the extra charge. The "spells" were another cool visual aspect of the movie. I think the filmmakers went out of their way to come up with a distinct look for them. They look nothing like what we've seen in the Harry Potter films, or even the magic used by other Marvel Cinematic Universe characters like Thor or Scarlet Witch. There was an interesting blend of music between a traditional orchestral score, and Eastern-sounding music. I feel this highlights the movie's blending of Western and Eastern cultures, as Stephen Strange finds himself traveling to places like Nepal and Hong Kong. Like most of the other Marvel Cinematic Universe movies, I don't the soundtrack is not full of "hummable" music (like the music you get in Star Wars, Indiana Jones, Jurassic Park, or other movies scored by John Williams). But I feel the composer, Michael Giacchino, does a better job than his Marvel predecessors. I would liken his use of themes here to his work on the recent Star Trek films. The score really focuses on one central musical theme, which helps guide the viewers' emotions. He also has the ability to really build up to that theme, and bring it forth triumphantly at the perfect moment. Looking ahead to the next Star Wars film, Rogue One, which will also be scored by Michael Giacchino, I think his style will be a good fit. Since Rogue One is a standalone film, it won't be necessary to create a library of themes like Williams did for the Star Wars films. The characters in this film likely won't be seen in any future films beyond Rogue One. So all Giacchino has to do is create one central theme that he can play with, while also incorporating Williams' existing themes for the Rebellion, the Empire, and the Force. 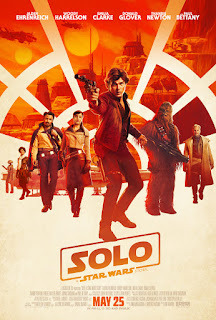 I'll only be able to cover a few of this movie's themes without getting into spoilers, so if you've seen the movie, be sure to read the spoiler section at the end of this post. The first one I noticed was materialism vs. spiritualism. The movie opens with a fascinating and fantastical action sequence taking place right in the middle of a big city. But the residents of the city perceive none of it, and they go about their daily routines completely oblivious to what is happening. Similarly, we go about our routines each day, unable to see the battle that is taking place on a spiritual level between good and evil. We are surrounded by countless souls that are either headed towards everlasting salvation or eternal damnation. Something else explored in the film is the contrast between following the rules blindly and the use of reason to understand those rules. During his training, Strange feels like he is being asked to just follow rules that make no sense. As a man of science, he wants to be able to ask questions, to understand why those rules are in place. This reminds me of my Catholic faith. Many people think that the Church just asks people to "have faith," and to do whatever the Church tells them to do. But in reality, the Church recognizes that faith and reason go hand in hand. And while we are supposed to submit ourselves to a higher authority (something that the movie's villain Kaecilius, played by Mads Mikkelsen, is unwilling to do), we are encouraged to ask questions and seek understanding (which the character Mordo, played by Chiwetel Ejiofor, does not do). I would highly recommend this movie. While there are some ties to the other Marvel movies (I'll get to those in the spoiler section), you don't have to have seen any of them to enjoy Doctor Strange. Thanks for reading! If you like my blog, and you'd like to receive emails each time I upload a new post, you can enter your email address below. What did you think of Doctor Strange? Do you agree with my thoughts on the movie? Do you disagree with a conclusion I've reached? If you want to express an opinion, ask a question, or give feedback about this post or others, feel free to leave a comment below, or email me at geekycatholicdad@gmail.com. The villain, Kaecilius, said something very interesting in the movie. His motivation was to gain everlasting life by pulling our world into the Dark Dimension. He said something along the lines of, "Humanity is destined for eternal life, and they can't be satisfied living in a world of mortality." My initial reaction was, "You're on the right track, man." If you take what Kaecilius was saying, and add in the fact that God is the one who can give us eternal happiness, you could almost be rephrase his words as, "You have made us for yourselves, O Lord, and our hearts are restless until they rest in you." Which of course, was written by St. Augustine. But Kaecilius is right in that we cannot be satisfied by the fleeting things of this world. We are meant for eternity. But the way he goes about trying to obtain eternal life is, of course, wrong. And I would argue that what The Ancient One does is wrong, as well. But we'll get to that later. Okay, we'll get to it now. The idea of doing evil actions for the sake of "the greater good" is discussed by the characters in the film. Kaecilius claims to be doing what he is doing for the good of humanity. And then we learn that The Ancient One has been taking energy from the Dark Dimension to extend her life. Stephen is not very happy about this at first, and he confronts Mordo and The Ancient One about it. Mordo doesn't believe him, but when he learns it is true, he is outraged. Stephen defends her, saying that she did it for "the greater good." I would have to side with Mordo in this particular debate. Then, in the film's final battle, Stephen uses the Eye of Agamotto to manipulate time, ultimately saving the day. To Mordo, this action is equivalent to what The Ancient One had done, because it violates the laws of nature. It breaks "the rules." (On a side note, this film uses the terms "laws of nature" and "natural law" interchangeably. They are not the same thing. The former is a set of facts about how physical things behave. The latter is the law written on the hearts of humans, which can be broken, but should not be.) In this case, I would side with Stephen. While messing with time the way he did was dangerous, I don't think it was intrinsically wrong. Whereas what The Ancient One did seems more like a bad thing, even if done for good reasons. Another theme is the hero's call, which should remind us of our own calling, or vocation. Stephen is continually called to enter a larger world, but he keeps resisting. This is summed up visually in a scene with the Cloak of Levitation. Stephen wants to run one direction, because he sees an axe that will make a good weapon against his attacker. But the cloak tugs him backwards. A struggle ensues while Doctor Strange comically tries to run towards the axe, but to no avail. Then he sees what the cloak is trying to lead him to - a device that will completely immobilize his enemy. It reminds me of those situations where we are stubbornly trying to do things our way, while God patiently tries to show us a much better way to go. And finally, there is the theme of selflessness. Stephen Strange is incredibly self-absorbed at the start of this movie. As the plot moves forward, he is continually learning to let go of things. First, he has to let go of some of his arrogance, as he sits outside Kamar-Taj begging to be let back in. He has to let go of his materialistic worldview. (By materialism here, I suppose I mean both the love of material things, and the belief that nothing exists beyond the physical world.) And finally he lets go of his selfishness. He is willing to exist indefinitely in a time loop where he is painfully killed by Dormammu - repeatedly - so that he can save the world. This section will have some spoilers for the rest of the movies in the Marvel Cinematic Universe. Major plot points from Thor and Captain America: Civil War will be discussed. I'll also be discussing the whole Thanos/Infinity Stone plot line that's been hanging over this whole franchise. So be warned. This movie probably had the fewest ties to other movies than any of the Marvel Studios movies so far. (For the record, those are the movies with Iron Man, the Hulk - but not the Ang Lee movie - Thor, Captain America, Guardians of the Galaxy, Ant-Man, and the Avengers.) But there were still some references to other movies and characters. Here are the ones I picked up on. Shortly before his car accident, Stephen is reviewing potential cases. They mention an Air Force colonel who suffered a spinal injury while flying an "experimental suit." This is obviously a reference to Rhodes (a.k.a. "Rhodey" a.k.a. War Machine), who was accidently hit by a blast from Vision during Captain America: Civil War. Stephen refuses the case, but as he was about to get in a career-ending car crash, it wouldn't have mattered either way. When Stephen is learning what it is that his fellow sorcerers do, Wong says that, while the Avengers protect the planet from physical threats, the followers of the Sorcerer Supreme defend against threats from other dimensions. Pretty straightforward, as references go. 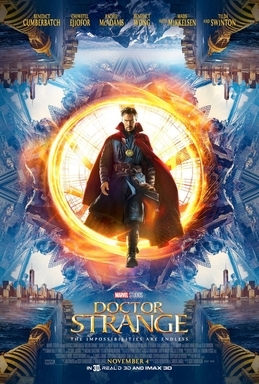 Towards the end of the movie, it is revealed that the Eye of Agamotto, which Doctor Strange had been wearing for half the movie, was actually an Infinity Stone. That would be the fifth Infinity Stone to appear in the Marvel movies so far. The Tesseract (Space Stone) featured prominently in Captain America: The First Avenger and The Avengers. The Aether (Reality Stone) was in Thor: The Dark World. The Orb (Power Stone) was in Guardians of the Galaxy. And we found out in Avengers: Age of Ultron that Loki's scepter held the Mind Stone. It's probably safe to assume that the Eye of Agamotto is the Time Stone. There are six total, so that leaves the Soul Stone. 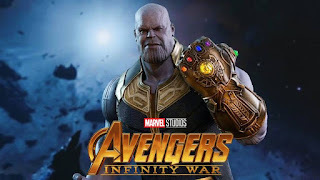 A large purple guy named Thanos plans to collect all six, attach them to The Infinity Gauntlet, and wield the Gauntlet's unlimited power to destroy half the universe. Presumably, this plot will culminate in the upcoming movie Avengers: Infinity War. There were a couple of visual ties to other movies. A few shots in The Ancient One's whirlwind tour of the dimensions reminded me of things we've seen before. One part kind of looked like the Bifrost, which is the way that Thor and his friends travel from Asgard to Earth and the rest of the Nine Realms. And there was a shot that was reminiscent of the Quantum Realm from Ant-Man (the place he goes when he starts shrinking without the regulator). The personal journey Stephen takes in this film reminds me of that of Thor from - well - Thor. When he locks himself in a time loop in The Dark Dimension, it reminds me of the way Thor stands up to Loki's Destroyer, willing to give up his life to save others. And then, of course, there is a more direct tie to Thor in the mid-credits scene, as Doctor Strange has a conversation with the son of Odin about why Loki has been brought to Earth. After a pretty humorous exchange, the bombshell is dropped that - it would seem - Doctor Strange will be assisting Thor in next fall's Thor: Ragnarok! All right, that's all I've got, folks. I already kind of wrote a conclusion to this post above the spoiler section. So, TTFN - ta ta for now!